Carl's Jr. gives a nod to their California roots with the launch of the new California Classic Double Cheeseburger. While a "California burger" conjures up different images depending on where you hail from, the limited-time California Classic refers to the retro style most associated with In-N-Out and their Double Double. In this case, it's a burger with double charbroiled beef patties, two slices of American cheese, grilled onions, Thousand Island dressing, tomato, and lettuce. 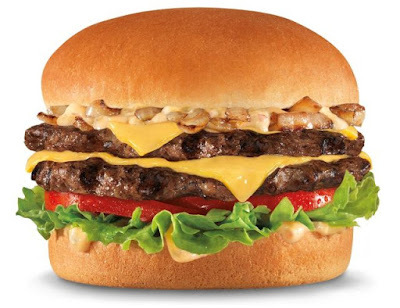 The California Classic Double Cheeseburger also manages a cheaper price than the Double Double at $2.49 (may vary) and can also be had in a combo with fries and a drink starting at $4.99. To sweeten the deal there's a $1 off any size California Classic Double Cheeseburger combo available off of the Carl's Jr. website.